Easy. The same way you would any other grocery product: list three or four functional benefits and put it on sale. So, here’s a sign from Pusateri’s in Yorkville. Notice that the ham promises that it is rich in Proteans (oops, sorry, Proteins), Calcium, Phospherous, Iron and Vitamins B1 and B12. 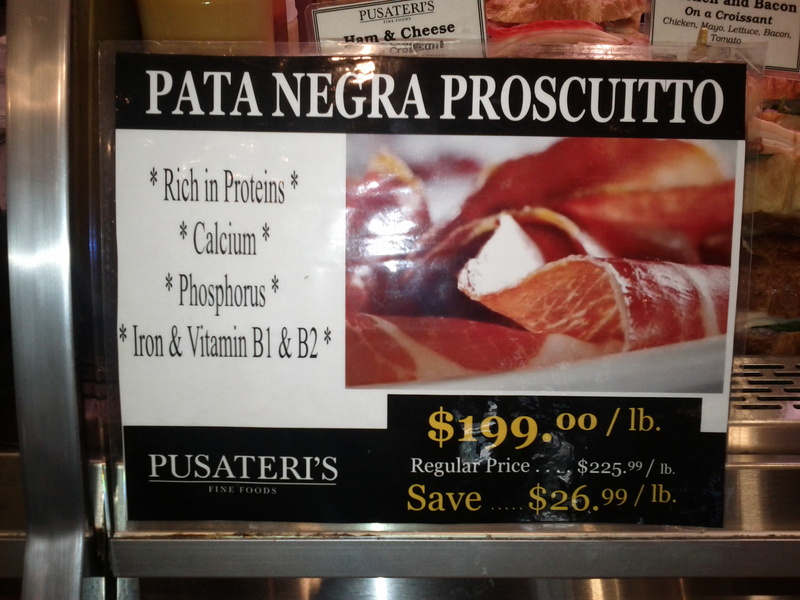 Considering that Loblaws was offering (March 27 flyer) San Daniele prosciutto silver, deli sliced for $1.79/100g or $17.90/kg, the Pusetteri’s ham should contain around 27 times as much Protein, iron, calcium, vitamins, etc. Or no rational person would pay the equivalent of $50 per gram for something that cannot be snorted no matter how hard and fast you chopped it. But, of course, no rational person would pay this, so Pusateris has DISCOUNTED the stuff. For a limited time (presumably limited to this life-time) you can buy the ham not for $500/kg, but for $440/kg a savings of $60/kg. Managed to fight the crowds to get a clear shot of this in-store merchandising device. Note that there is no mention of better taste, cleaner pigs, or any unrational reason to pay a premium of 2700% for prosciutto. Who says the stupid rich aren’t suckers for a good deal. But, as any retailer knows, they should have included this in the weekly flyer. The likelihood of losing an account for an agency is in direct proportion to the quality of the advertising!